This article explores the boundaries of socio-technical IT systems for knowledge development, using military environments in a case study approach. The need to examine the effects of socio-technical convergence of human systems and computer systems is emerging in many fields. The article examines both the risks and the potential in military critical-environments for early adoption of socio-technical systems. 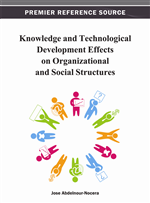 The author addresses risks for creative knowledge creation by too-early adoption of information technology and the effects on socio-technical systems and sense-making. Such risks are more easily highlighted in a critical, stressful environment (stressful for man, machine, and their co-operation) with high-stakes. However, examined military environments are proposed as point of reference leading to further research in other sectors. The author argues for a socio-technical analysis before, during, and after adoption of new systems, especially those relating to knowledge development, reviewing boundaries created. Finally, the author discusses the future promise of socio-technical convergence of man-machine for knowledge development. This article explores the boundaries of socio-technical systems (in particular, those related to information technology) for knowledge development, in various Military environments including the different echelons of command. It does so by using a case study approach to knowledge development in military environments, although the focus is a conceptual, high level, analysis of the emerging trends and model rather than the specifics of the case study environments. The need to examine the effects of socio technical convergence of human systems and computer systems is emerging in many fields. Yet, the critical environment of the military provides a unique opportunity to explore both risks and potential. Since militaries have many socio-technical systems defined, and are in many cases ‘early adaptors’ of technology, it may act both as point of reference and lantern for further research. The risks for creative knowledge creation by too-early adoption of information technology and the effects on socio-technical systems are easier to highlight in a critical, stressful environment (stressful for man, machine, and their co-operation) with high-stakes. The paper argues for socio-technical analysis before, during, and after adoption of new systems, especially those relating to knowledge development and reviewing the dimension of boundaries created. There is risk of irrelevancy in attempting to write on contemporary technological issues, even more so on societal trends of implementing technology. It is a dynamic, ever-changing reality—a constant social construction of emerging behaviours. Any given example or empiric grounding may be rendered obsolete by the time a paper is read, and thus the reader is urged to relate to the conceptual directions portrayed, and to position this reflection of social construction within its context, as a ‘work in progress’. Not the paper itself, but rather societal progress of socio-technical systems’ convergence with human behaviour.